How deep is the class divide in American politics today? According to some scholars and pundits, it is very deep indeed. In a recent post on the Washington Post’s Monkey Cage blog, Larry Bartels of Vanderbilt University, the author of Unequal Democracy and a highly regarded public opinion scholar, presented evidence from a multi-nation public opinion survey that showed the relationship between income and support for cuts in government spending was considerably stronger in the U.S. than in other industrial democracies. Because of the disproportionate political influence wielded by upper-income citizens in the U.S., Bartels argued that their strong support for spending cuts has had a powerful influence on elite attitudes and ultimately on government policies. Bartels’ findings were cited by Paul Krugman of the New York Times, one of the nation’s most influential liberal pundits, as evidence that the United States has become a “class-ridden” society in which income has a powerful influence on political attitudes and behavior. But is this really true? Before accepting results from one study as authoritative, we should examine evidence from other recent national surveys on the impact of social class on political attitudes and behavior in the U.S. to see if they show a similar pattern. For this article, I analyzed data from the 2012 American National Election Study, the most recent edition of one of the most widely used and respected academic surveys of the American electorate. The 2012 ANES surveyed a representative national sample of more than 4,000 voters in person and via the Internet before and after the November general election. Respondents were questioned about their social characteristics and opinions on a wide range of policy issues as well as their voting decisions. The evidence from the 2012 ANES indicates that the class divide in the American electorate was not nearly as deep as Bartels’ findings suggested. Upper and lower-income Americans did not differ very much in either their presidential voting decisions or their opinions on a variety of major policy issues including government spending. Other characteristics such as race, partisanship and religion had much stronger effects on Americans’ political attitudes and behavior in 2012. Perhaps the single most important political decision that American voters get to make is who will occupy the White House for four years. If social class has a powerful influence on public opinion and political behavior, we should find evidence of its effects in presidential voting decisions. Given the contrasting positions of the two major parties on economic policies benefitting upper and lower-income Americans in recent years, as well as the contrasting backgrounds of Mitt Romney and Barack Obama, one might have expected upper-income voters to be much more likely to support the Republican candidate than lower-income voters. 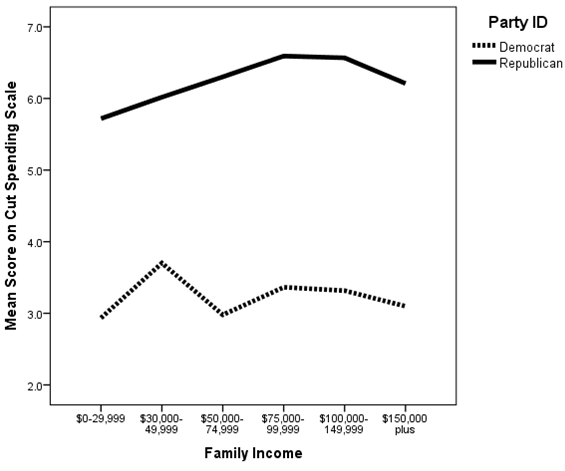 However, the evidence displayed in Figure 1 shows that family income was only weakly related to presidential voting decisions. Because of the strong relationship between race and both income and partisanship in the United States, I have displayed the results for non-Hispanic whites, African Americans and Hispanics separately in this figure. For two of these racial groups, whites and African Americans, the data show that there was almost no relationship between family income and candidate choice. African Americans, regardless of income, voted overwhelmingly for Barack Obama. Whites with family incomes of greater than $150,000 were only slightly more likely to vote for Mitt Romney than whites with family incomes of less than $30,000. Only among Hispanics was there a clear relationship between income and vote choice. Affluent Hispanics were considerably more likely to vote for Mitt Romney than lower-income Hispanics. However, even among the very small group of Hispanic voters with family incomes of greater than $100,000, Obama outpolled Romney. 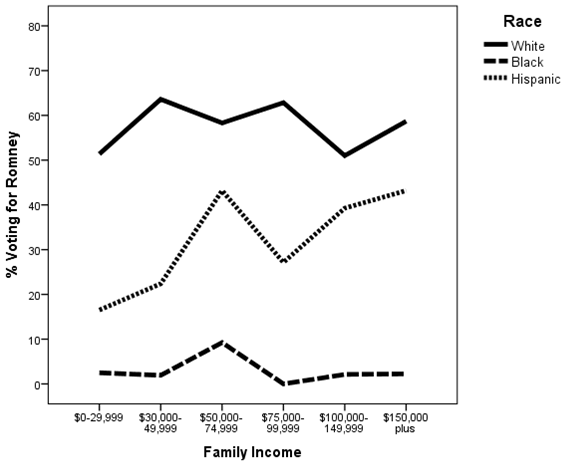 Moreover, it is very likely that wealthy Hispanics differed in other ways from low-income Hispanics, such as country of origin and length of time in the United States, and that these other differences might have contributed to their greater inclination to vote for the Republican presidential candidate. Why was there such a weak relationship between income and presidential candidate choice in 2012? The explanation for this finding is that income was only weakly related to the most important political attitudes that shaped voter decision-making in 2012: attitudes such as party identification, ideological identification and opinions on the 2010 health care law. On all of these questions, after controlling for race, the opinions of upper-income voters were similar to those of lower-income voters. And this holds true as well for the issue that Bartels focused on in his Monkey Cage blog post: federal spending. Figure 2 displays the relationship between family income and a scale measuring support for cutting federal spending on domestic social programs in five key areas: child care, public schools, the environment, aid to the poor and welfare. For each area, respondents were asked whether spending by the federal government should be increased, remain the same or decreased. I combined these five questions into a scale with scores ranging from zero to 10, with zero indicating consistent support for increased spending and 10 indicating consistent support for decreased spending. Results are again broken down by race. 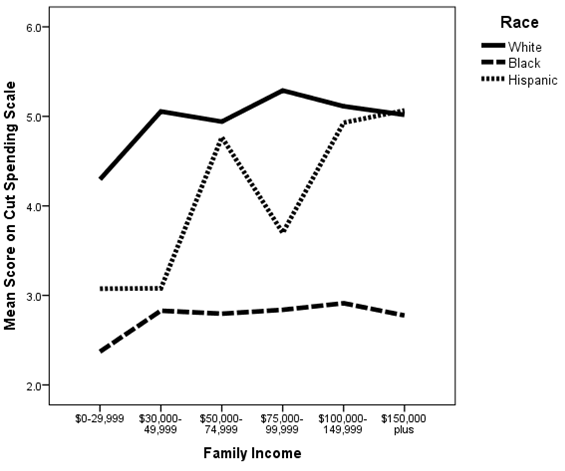 The results displayed in Figure 2 show that among both whites and African Americans, there was only a weak relationship between family income and support for cutting domestic social spending. In both groups, those with incomes of greater than $150,000 were only slightly more likely to favor spending cuts than those with incomes of less than $30,000. Only among Hispanics was there a clear, although somewhat uneven, relationship between income and support for cutting spending on domestic social programs. The findings in Figure 2 show that white voters, regardless of income, were fairly evenly divided on whether federal spending on social programs should be increased or decreased. In contrast to the minimal effect of income, however, party identification had a very strong impact on attitudes toward spending on social programs among white voters, as the results displayed in Figure 3 demonstrate. Regardless of income, Democrats generally wanted to see spending increased while Republicans wanted to see spending decreased. Lower-income Republicans were only slightly less likely to favor cutting spending on social programs than upper-income Republicans, while upper-income Democrats were just as supportive of increased spending on social programs as lower-income Democrats. The results in Figure 3 show very clearly that attitudes toward federal spending on social programs are shaped much more by partisanship than by simple economic self-interest. Thus, lower-income Republicans generally favored cutting spending on social programs while upper-income Democrats generally favored increasing spending on such programs. These findings reflect the fact that most Americans today do not base their political attitudes or behavior primarily on simple economic self-interest. Other factors, especially religious beliefs and moral values, often play a larger role in those decisions. For white voters, this was clearly the case when it came to choosing a presidential candidate in 2012. The results displayed in Figure 4 show that regardless of income, whites who attended religious services at least once a week were much more likely to vote for Mitt Romney than whites who seldom or never attended religious services. 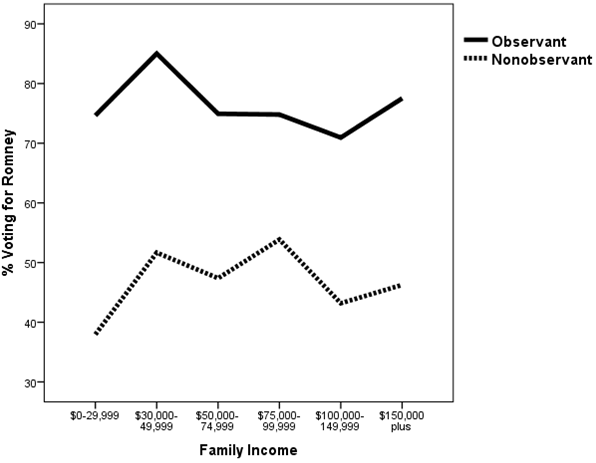 Family income had only a weak relationship with presidential vote among non-observant whites, and no relationship at all among observant whites. The vast majority of highly observant whites voted for Mitt Romney regardless of income. In fact, over 80% of highly observant whites with family incomes of less than $15,000 voted for Mitt Romney. What these results make clear is that among white voters in the United States, when it comes to choosing a presidential candidate, religion trumps class. There is no question that economic inequality has increased in the United States over the past few decades. Income and wealth are now more concentrated at the top than at any time since at least the 1920s. And there is also no question that growing economic inequality is affecting American elections, especially in the aftermath of recent Supreme Court decisions allowing virtually unlimited spending by corporations and wealthy individuals. The partisan orientations and policy preferences of the super-wealthy are probably very different from those of other Americans, even those in the highest income categories found in public opinion surveys. But the super-wealthy comprise much too small a fraction of the American electorate to influence the outcomes of elections through their votes. The findings presented in this article show that within the range of incomes found in public opinion surveys, there is only a weak relationship between income and either opinions on major issues or voting decisions. Those opinions and voting decisions are influenced much more by factors such as race, partisanship and religion than by differences in income. Moreover, the results from the 2012 ANES survey are very similar to those from earlier elections. The correlation between family income and major party presidential vote in 2012 was a very modest .13, which was identical to the average correlation between family income and major party presidential vote across all elections between 1948 and 2008. While both economic inequality and partisan polarization have increased over time, there is no evidence that these trends are directly related. The partisan divide between upper and lower-income Americans has not increased substantially in recent years. Moreover, other measures of social class, such as educational attainment, show a reverse trend. College graduates and especially those with a post-college education are now significantly more Democratic than those without a college degree. The clear implication of these findings is that growing income inequality cannot, as some have argued, explain growing partisan polarization in the American electorate. Americans today are more deeply divided along party lines than at any time in recent history, but those divisions have little to do with social class.